The train will be leaving Port Huron a little earlier starting Oct. 14. The start of the third phase of a track improvement project will bump the Port Huron westbound train departure time from 6:20 a.m. to 5:20 a.m., according to Marc Magliari, spokesman for Amtrak. Amtrak Blue Water Train 365 will depart an hour earlier from the Port Huron station Mondays through Thursdays from Oct. 14 to Nov. 21. “The goal is to have all this work done before the big Thanksgiving travel season,” Magliari said. The train will depart at its regular times on Friday, Saturday and Sunday. Eastbound trains will maintain their regular schedules. The track improvement is part of an effort among three states to improve the 300-mile track from Pontiac and Detroit through northwest Indiana and to Chicago. The new track will allow trains to reach about 110 miles per hour. “Blue Water passengers will benefit from higher speeds from Kalamazoo to Battle Creek,” Magliari said. 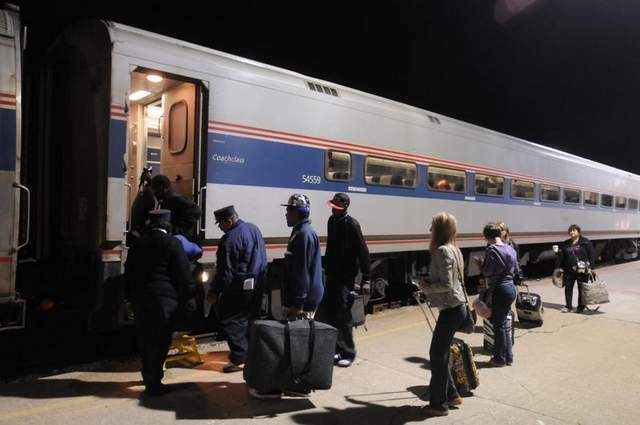 The use of the train by Port Huron riders increased from 2011 to 2012, according to Amtrak numbers. About 24,015 tickets were bought to or from Port Huron in 2011. That number jumped to 26,696 in 2012. The 2013 ridership numbers will be released next week, Magliari said. The Michigan Department of Transportation is taking the lead on the project, said Nick Schirripa, spokesman for MDOT. MDOT is maintaining the tracks, and Amtrak is acting as the service provider, he said. The first phase of the project — started Sept. 9 — included infrastructure improvements from Dearborn to Jackson. The second phase included a section of track from Jackson to Battle Creek. The third phase — starting Oct. 14 — will encompass Jackson to Kalamazoo. The 2013 construction, which cost about $23 million, encompasses more than 30 miles of new track and 130,000 new cross ties. The project was funded by the Federal Rail Administration, Schirripa said. The completion of the project will decrease end-to-end travel time between Pontiac/Detroit and Chicago by two hours.